Hey, What Should I Do Now? 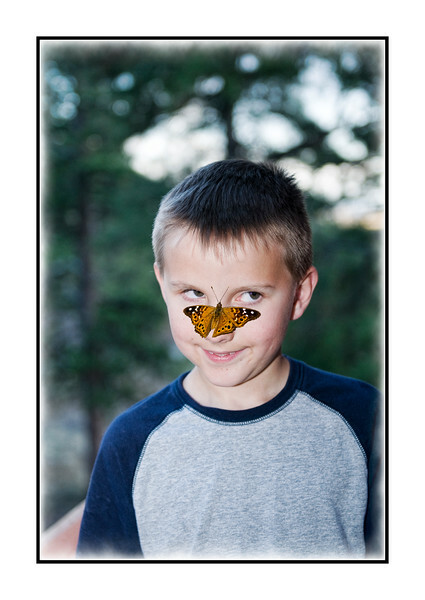 My grandson, Spencer, with a butterfly on his nose. Regretfully, I must admit that this is a fake. Two separate photos. I cut out the butterfly from another image and moved it onto Spencer's nose. I've always wanted to capture a shot like this, so I decided to create it from scratch. Thanks, everyone, for taking the time to give me advice about how I could improve the HDR-like suburbia shot. You gave me some really good suggestions, so I'll keep working on it. Tatiana asked what I used to cut out the butterfly. I used Photoshop CS3, the magic wand tool (which is so much better in CS3 than it was in previous iterations of the software). hahaha! this is hysterical! I looked at it XLARGE, still great!! :-) bet he loved it too. Well done.. I could never tell it was a fake. which program did you use to cut the butterfly out? Nice treatment on this photo too. Thanks for your note a few days ago! I've been extremely busy with work and family stuff and am on a semi-permanent hiatus from the dailies. I do take time during the week to see what everyone has been up to. Ha! It's still funny, though. :-) Good job putting the two images together, you really can't tell. fun shot. Spenser's face give the look as if it is real.